Entrance to the Mid-Week Farmers Market at Pukalani Stables in Waimea.The Waimea Mid-Week Farmers Market at Pukalani Stables has only been in existence since early April of this year, when it migrated from its previous location at Anna Ranch. The Market is managed by a board of directors and sponsored by the Paniolo Preservation Society. At the time of the move, 12 vendors relocated and since then the number of vendors has increased to 28. They come from Waimea, the Hamakua Coast, Waikoloa, Kohala and some as far away as Puna, offering produce, food products, arts & crafts, and almost anything that has been grown or made locally on Hawai’i Island or within the State of Hawai’i. The range of products that can be found includes fresh varieties of vegetables and tomatoes, mushrooms, fruits, and herbs; flower bedding, landscaping plants, container plants, and organic bokashi fertilizer; freshly cut flowers, hot & cold brewed Hamakua coffee and coffee beans; macadamia nuts and dehydrated fruits; and freshly pressed vegetable and fruit juices, as well as citrus coolers and artisanal goat cheese. Other products include fresh baked artisanal breads and pastries, fruit pies, and kettle corn; hot lunch bentos, teriyaki plates, quesadillas, and beef sliders; lilikoi juice cooler, nuts, locally made fruit jams and jellies, home made pesto, tapenades and coffee caramel sauces. This all-purpose market features recorded and live music entertainment and includes local hand-made crafts such as jewelry, koa wood brushes and fountain pens, greeting cards, note pads and business card services. There are facial and body products, lotions and soap bars, and clothing -- Hawaiian shirts, pareos and dresses, baby blankets, slings and hand made scarves. To top it off, there are vendors with homemade dog treats, toys and massage. 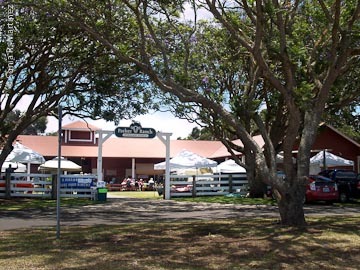 The market location at the Parker Ranch Pukalani Stables and Paniolo Center Heritage Museum is a historical landmark. This location offers ample parking, comfortable weather, a protected market site and lots of space for future growth. In the plans for the near future are cooking demonstration and classes on nutritional cooking and value shopping; evening events with culinary contestants and demos. EBT services also will be offered soon. The market is partnering with local organizations for community events: "Paniolo Talk Story" with Paniolo Preservation Society (July 21), and Hawaiian Horse Expo (Aug. 11-12). 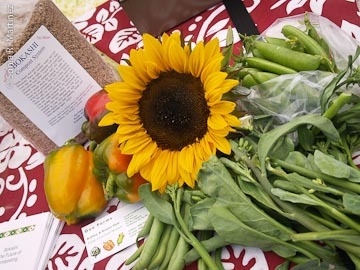 Produce by Goo Farms.Ashley and Evann Goo are owners of Goo Farms in the Lalamilo area of Waimea. They are fairly new to this market although they have been participating at the Keauhou Saturday Market for many years. Goo Farms has been in business for over 30 years and is becoming organic although will not be certified. The farm was originally owned by Ashley’s family and had been operated by his mother for many years. They grow seasonal vegetables as well as many types of flowers; at the time of our visit the offerings were green beans, sugar snap peas, collard greens, bell peppers, beets and sun flowers. A new enterprise for the farm is the making of Bokashi, a Japanese form of composting with effective micro organisms that is simple and odorless. The Goos are hoping Bokashi will become popular and believe that especially in Puna areas where soil is scarce it will be a good resource, since it will allow the farmers to make their own soil instead of purchasing and risking bringing in insect and weed pests. 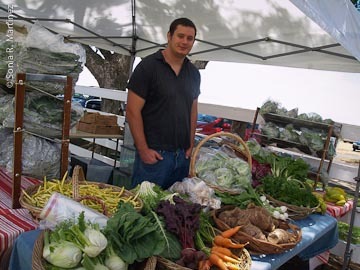 Ken & Roen Hufford, owners of Honopua Farm in Waimea, are not new to the farmers market scene and participate in another local market on Saturdays. They have been farming at their 2900 foot elevation farm in the Puukapu Farm Lots for 20 years. Joe Hufford of Honopua Farms.The Huffords practice organic methods of farming but the farm is not certified organic. It was originally started as a flower farm by Roen’s parents and eventually vegetables were added. Now a large selection of both flowers and vegetables are grown, among them, leafy greens; kale, lettuces, spinach and salad mixes. Other seasonal vegetables that are offered when available are carrots, beets, turnips, and cabbage. The Huffords also distribute mushrooms from the Hamakua Heritage Mushroom Company. The array of vegetables at their booth is colorful and very appealing. On the day of our visit, their son Joe Hufford was manning the booth. A booth that was attracting a lot of attention was one where the mouth watering aroma of ono grilled meats freely escaped to reach all corners of this market. 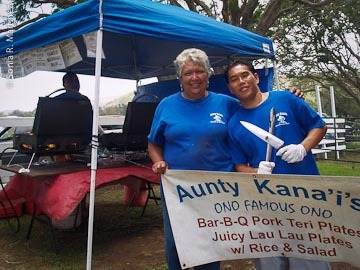 Aunty Kanai’s Famous Teriyaki BBQ is run under the auspices of Aunty Kanai Tegman and her “Church on the Road” Mission, a non-denominational church where she ministers to anyone with needs. Proceeds from the sale of her sauces and marinades as well as the teriyaki pork BBQ, grilled ono, and ‘onolicious’ lau-lau go to support her many charities and causes. Aunty Kana'i's Famous Teriyaki BBQ.Her booth is spread out into two areas; the stand-alone tent where the meats and fish are cooked over open flames and the other is just across the way under the stable roof where the plate lunches are assembled and sauces sold. On the day of our visit the teriyaki meats were being grilled by Roscoe Kailimai, and Charles Pila was helping Aunty Kanai to prepare the plates. If you’ve never tasted Aunty Kanai’s ‘Famous” Teriyaki Sauce and Marinated BBQ, you have a treat in store…the open-fire flames lick at the meat until the edges caramelize and turn crispy while the rest of the meat is succulent and tender. While strolling through the market we were able to visit with several vendors whom we have met or featured in the past in other markets: Honomu Jams & Jellies, Mauna Kea Coffee Company, Hawaii Island Goat Dairy, John Romoa’s Orchidpeople, Palani Bread Bakers and Nancy Boticelli with Kawaihae Card Company. Type of market: Local nature of the product/s (raised, foraged, grown, caught, crafted on the Big Island or within the state of Hawaii. Current products: Fresh produce, varieties of vegetables, mushrooms and fruits, fresh baked artisan breads and pastries, mango and apple pies, cookies, cup cakes and chocolate confectionary, variety of tomatoes, mac nut and dehydrated fruits, freshly pressed vegetable and fruit juices, citrus cooler, artisan goat cheese, unique repurpose hand crafted jewelry, semi-precious stone necklaces and bracelets, koa wood brushes, fountain pen and crafts, landscaping plants, vegetable/ herbs and flower bedding plants, container gardens, kettle corn, shitake mushroom starter kit logs, organic bokashi fertilizer freshly cut sun flowers, hot & cold brewed Hamakua coffee and coffee beans, hand made photographic greeting cards, note pads and business card services,, facial and body products and lotions, soap bars, hawaiian shirts pareos and clothing, massage therapy, bentos, hot lunches, teriyaki plates, quesadillas, beef sliders, lilikoi juice cooler, sweet roasted pecans, walnut and mac nuts, local made fruits jams and jellies, home made pestos, tapenades and coffee caramel sauces, baby blankets and slings, hand made scarves, therapeutic massages, homemade dog treats and toys. Best selling products (by income): Lunches, fresh vegetables and fruit, desserts, jewelry, coffee. Special features: Historical Landmark: Parker Ranch Pukalani stables and Paniolo Center Heritage Museum, recorded and live music entertainment future EBT services, evening events with culinary contestants and demos, partnering with local organizations for community events. Sonia R. Martinez, the Hawai'i Homegrown Food Network regular farmers market reporter, is a cookbook author and freelance food writer for several publications in Hawai'i, including The Hamakua Times of Honoka’a. She is a contributing writer for Edible Hawaiian Islands Magazine and has her own food & garden blog at soniatasteshawaii.com.